I don’t know Kalsoom but I get the feeling that your article is more about one side having more technical advantage then other and therefore its not a battle of equals. I think if what is happening in Pakistan and Afghanistan can be called war I would prefer drones more then man-to-man conflict. Man-to-man results in collateral damage which cannot be accounted for. At least with drones we know that people who died were terrorist or civilians. In Sri Llanka when state took over LTTE, there is no account of what actually happened, there are just stories, similarly when Iraq and Iran were at war we heard lot of stories, don’t know which of them were true. Now you can at least show pie-chart to US administration and ask for adequate compensation if nothing else. A lot of chatter has happened about Pakistanis running their own drone attacks, rather than just supplying intelligence. I don’t think given the current relationship this is something the U.S. government would ever openly do, but it’s been an interesting back-and-forth nevertheless. Preferable to an operation, where more lives are at risk. Somehow, probably due to charades pulled by political parties (who themselves privately endorse them), our perception of the drones has turned negative. On a serious note, with the very bombing of Hiroshima we had lost touch with the human aspect of warfare. The kind of advancements Japanese have already made in Nano technology is frightening. However conventional warfare strategy will never lose its significance despite an emergence of a new kind of enemy (rogue groups) and robotic methods to counter them. Complete annihilation may require high tech weaponry but post annihilation control consolidation and rehabilitation will remain absolutely critical and thus the presence of ground forces with conventional armoury and wisdom. Americans may have progressed on the first but miserably failing on the latter!! Drones do seem like a big improvement over carpet-bombing! If the US didn’t have drones, NWFP would probably be getting carpet-bombed, like the Cambodian-Vietnam border area during the Vietnam War. Also, in modern jets the pilot is also looking at a computer screen (i.e., no visual contact with actual target), so the difference between getting whacked by a drone and by a modern jet aren’t too different in terms of being a mere “dot.” The real Rubicon will be when the drones actually are automated (rather than “remotely-piloted”)–that probably won’t happen until the next big war, because it seems too scary. . . . but, imperatives of the next big war will push it to be done. 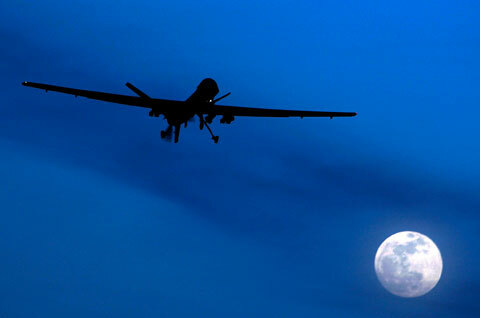 if Pakistan complies with US’ Stance probably the drones would never have had come. but if Pakistan plays a double agent, then US is left with no other option. there are international laws and laws of war that provide guidelines for the lawful use of drones. unfortunately, the use of drones by the US lacks transparency and has resulted in a disproportionate loss of civilian life. if only there was accountability in this regard so that we can set the right precedent going forward. (see also http://www.humanrightsfirst.org/2011/03/18/wanted-more-light-less-heat-about-drone-attacks/). 1st of all another great article by Kalsoom. Keep up the good work. Khalid, I don’t agree with you buddy. 1st of all if you’d like to call double agent, don’t say Pakistan (It’s Pakistani Government). I am a Pakistani living in USA for about 12 years. People who believe in American media and don’t like to think by themselves have exact same thing to say, what you’ve just said. Lets say if American Government thinks that Pakistani Government is playing double agent, why don’t they stop aiding this double agent and save some money as they (USA Govt.) are almost bankcrupted. But sad part is they are also going along with Pakistani Government being a double agent (Stupid American Politicians or Some Hidden Agenda) who knows. I am completely again drone attacks because you kill 70 innocents and 30 millitants that ends up 140 (70×2 if each dead civilian have 2 family members) more people who have the potential to be a so called millitant. If Pakistani Govt. is a double agent why they are like this. Everyone knows they are hungry for money, so staying as American agent keeps their pockets or rooms full with cash. On otherside they also like to stay somewhat loyal to Pakistani side (That’s keeping them in Power). If they won’t be in power, America won’t be interested in them. Long story short, Pakistani Govt can take the money and throw it with their secret stash and kill the millitants. (They’re gonna die by drones anyway). This way USA will be happy. Hide some killing (just the way they hide crimes by them). Keep their pockets full and save a lot of innocent people. God, help us to forgive each other, love each other so we can make it a peaceful world.